Can Ancient Greek Philosophy help cure Depression and Anxiety? As far as societies go, we're one stressed out, anxious, depressed and self-medicating mess. Those of us who work on the front-lines in the mental health field know this all too well; others need only to take a careful look around the social-cultural landscape to appreciate that our collective mental health is not too, well, healthy. And things seem to be getting worse. According to Dr. Steven Ilardi, the University of Kansas psychologist, researcher and author of The Depression Cure (Da Capo, 2009) "Americans are 10 times more likely to have depressive illness than they were 60 years ago...and a recent study found the rate of depression has more than doubled in just the past decade". Globally, things aren't much better; according to the World Health Organization (WHO) 450 million people worldwide are directly affected by mental disorders and disabilities and that by 2030 depression will top the list of all other health conditions as the number one financial burden around the world. Dr. Ilardi thinks that he's found the answer: Increased rates of depression (not to mention other mental health woes like anxiety and addiction) are a byproduct of our modernized, industrialized and urbanized lives. It seems that our love affair with the gadgets, gizmos and comforts of being a highly technologically evolved society have put us on a never-ending treadmill of overworking, under-sleeping and hyper-stressing as we exhaustedly lunge towards the "American Dream". Yes America, our need for i-Phones, plasma TVs and a bigger house is killing us. And what happens when we work longer hours in soul-crushing cubicles to buy things that we don't need? According to Dr. Ilardi: "We've been engineering the activity out of our lives. The levels of bright-light exposure-time spent outdoors-have been declining. The average adult gets just over six and a half hours of sleep a night. It used to be nine hours a night. There's increasing isolation, fragmentation, the erosion of community." Thus, according to Ilardi, "We feel perpetually stressed. And the more we learn about depression neurologically, the more we learn that it represents the brain's runaway stress response". Ilardi had found that certain societies-such as the American Amish and the Kaluli people of Papua New Guinea, had essentially zero rates of depression. The more he looked at the commonalities of these "depression-free" societies, the more he was able to tease out certain common variables that he was then able to operationalize in his groundbreaking research dubbed the Therapeutic Lifestyle Change Project wherein clinically depressed subjects were asked to incorporate several of these lifestyle changes into their lives for several weeks. So what were these magical lifestyle changes (which have also become known as "Caveman Therapy")? They were essentially 6 things: eating an omega-3 rich diet; getting regular daily exercise; getting plenty of natural sunlight; getting ample sleep every night; being involved in some type of social activity where social connections were made; and participation in meaningful tasks that leave little time for negative thoughts-all things that our ancestors had in abundance. Amazingly, Dr. Ilardi's research subjects demonstrated incredible reductions in depression. Indeed, these reductions were statistically significant not only when compared to control groups, but also when compared to people who had been treated only with depression medications. 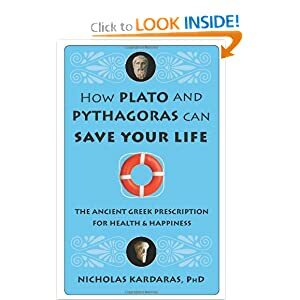 In my own research (presented at the 2007 APA conference) that's described in my book How Plato and Pythagoras Can Save Your Life (Conari, 2011), I also made similar discoveries based on ancient wisdom. I describe a very holistic way of living that had been known in the ancient world as the "Bios Pythagorikos" (the Pythagorean Way of Life) that included a healthy vegetarian diet, daily rigorous physical exercise, and philosophical group discussions (dialectical discussions) that were meant to help a person better understand their universe and their purpose within that universe. And living ethically was also essential. For the Greeks, act-right/think-right were the keys towards well-being. Participants in my study who immersed themselves into this more engaged, reflective way of life experienced the following: meaningfully increased levels of personal as well as transpersonal awareness; an increased appreciation for life (as well as death); an increased sense of purpose in their lives; an increased sense of concern for others, as well as an increased sense of spirituality and self-acceptance. So if you're feeling depressed or stressed out, instead of reaching for the medicine cabinet, maybe it's time to try a very old-school--as in ancient--solution; you might be amazed at how differently you feel and how differently you experience the world. You should know as well as anyone else that correlation does not imply causation. My guess is that there is something more deeply wrong with society than simply the fact that we are absorbed by our gadgets. The increasing level of isolation among neighbors, family members, friends, etc. predates the invention of the iPhone! I think that's a pretty glib and superficial analysis. Read Peter D. Kramer. Start with, Listening To Prozac, then go to, Against Depression. A Jew that is smarter than the entire Greek civilization. Concerning society-Do you really think it was better back then? I'm afraid you missed my point. Yes, I agree with you, the societal ills of isolation and overworking-that-leads to stress, etc. do indeed predate the i-phone. But in my blog, I wasn't demonizing technology and the i-phone per se (although many others have written about the isolating aspects of technology). I was writing about something else entirely; if you read my sentence regarding the i-phone carefully, I said "our NEED for the i-phone...is killing us". Thus my point was that it was an increasing level of consumerism (the aforementioned "need") that has led to our over-working, over-stressed state in order to buy the next bigger and better thing; I simply used the i-phone as a metaphor for that next bigger and better thing. The creation of this obsessive consumerism has been traced by sociologists back to various points in our history: the industrial revolution; the post-WWII push to create a consumer middle class with the evolution of modern advertising; the early 70s with the invention of the first credit card, etc. For the record, I have a smart phone. So I don't think my little android phone is killing me, but if I was working myself to death to buy it, then that might be a problem. I'm certainly not going to go there regarding your comments about "a Jew that was smarter than the entire Greek civilization"; this is not a comparison of ethnicities. And, yes, in many ways, I do think that it was better then. If that is my misguided romanticizing a past era, then so be it. You can take my advice, or not. Increase smartness, or not- It's your choice. I will be forced to challenge your emotional idealism; just as our ancestors would have demanded of me. Thank you for your response. Reading your article again, I'm afraid that due to the late hour I had missed your point. The article does require some careful reading. "Gadgets, gizmos, and comforts" is indeed less reductive than I had initially assumed, and in general I think you make a great point. Even if one doesn't share the materialist motivation to the extent that you describe (e.g. "All I want is a nice place to live and to be able to support myself"), one finds oneself carried along by the standards and mores of the society in which we live (e.g. feeling pressure to work more because your place of employment is understaffed, etc.). My standing social engagements and my participation in team sports, which do help me achieve a lifestyle closer to the ancient one you describe, definitely are lifesavers. David, well I certainly appreciate your pity for my un-enlightened and un-evolved "old thoughts". But I really haven't heard anything about what your superior "new" thoughts are; you reference an author, made a jab at Greek versus Jewish thought and left it at that. I wish you would do what you said you would do: challenge my "emotional idealism" (although I'll dispute the emotional and grant you the idealism and even monism). But you haven't done that; you have to do more than just calling ancient Greek thought as "old"...otherwise, you sound rather dogmatic for so called "new Thinking" that you don't articulate. And would you really categorize all of ancient Greek thought as one homogeneous way of thinking in your rejection of it? But the thesis of my blog wasn't even so much an exposition on Greek thought; rather, my thesis was that a shift towards consumerism has led to an increase in work/stress/depression/isolation...does your enlightened perspective dispute that thesis? the behaviors advocated here are surely part of a good, healthy life. Many who suffer from depression are unaware of how much their life style may affect their depression ands how much they can improve their moods through lifestyle modification. Couldn't agree more with the simple behaviors chosen as a great start. Wiyh respect to social connection, science and experience show that deeper, closer connections are superior. This takes courage to be truly authentic and honest about our fears, inadequacies, imperfections, etc. Part of the malaise exeperienced by many is the inaccuarte belief that everyone else has it perfectly together and we/you are the only one with self doubt, fears of inadequacy, etc. Moreover, I do not believe it is consumerism per se that is detrimental to mental health. Having gadgets, pleasures and luxuries can advance mental and emotional health if acquired by a healthy individual. We are societally stuck in the erroneous belief that we are measured by how many possessions we've gathered, how many triumphs we have achieved. Thus, most people are miserable ebacuse they are not the "someone else" of their fantasies: e.g., the "rich guy" next door. Meanwhile, the "rich guy" next door feels he's inadaequate and failing because he's focused on the "next rich guy up the street." We are not alone, we all have fears and are, indeed, imperfect. There's too much to explain, you'll just have to read the suggested author. Concerning Depression and lifestyle- There's just no reason to think, we were better off back then. Depression and altered moods were well known, and documented in ancient Greece. We also know more about Bipolar diseases; Because of this, happiness is being challenged at the moment. It's easy to believe (or imagine) people of the past were happier,especially when the past is so silent. Hope you have a nice weekend. Thanks, for the response. David, good points. I see where you're going with your bipolar comment; but I'm not suggesting that any past civilization was mood-disorder free; just that, based on research like Dr. Ilardi's that I've cited, that perhaps the environmental/societal factors contributing to mood disorders may have been less. But don't get me wrong; I teach meuropsychology and have worked for several years in a psychiatric hospital, thus I have a very healthy respect for organic brain disorders and the effects of neurochemistry on the brain. And thank you for the Kramer suggestion; I will indeed pick it up and give it a read. Thank you again for engaging thoughtfully in this forum. Dear Jay, no worries; thanks for clarifying. I'm with you, team sports and social engagements can indeed be lifesavers. ... that capitalist social relations are toxic. Marx's analysis of capitalism is more relevant then ever in our toxic society. The middle class and poor exist to make the rich richer because the wealthy own the means of production. Americans are some of the dumbest people on planet earth. The real issue is that our socio-economic model using the wage system is dumb, it forces us to make dumb unscientific environmental decisions by creating "externalities" (capitalist doublespeak for the fact that we don't want true nature based economic science).